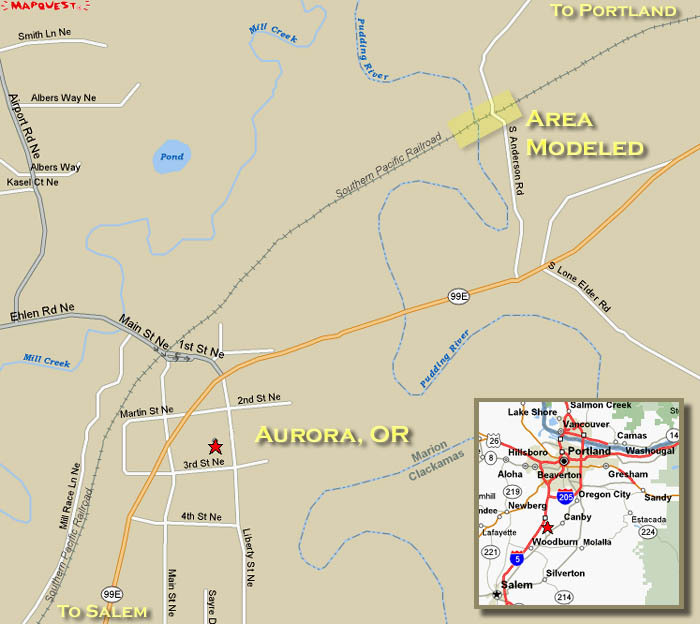 For my first Free-mo module, I chose to model a portion of the Southern Pacific's (now UP) main line between Portland and Salem, OR, where the track crosses the Pudding River on a truss bridge just north of Aurora. One of the things that attracted me to this scene is that, while it first appears to be a simple river crossing, further examination reveals all sorts of classic Southern Pacific details that just beg to be modeled. It's also small and simple enough that the scene can be modeled with minimal compression while still capturing the essence of the prototype location. 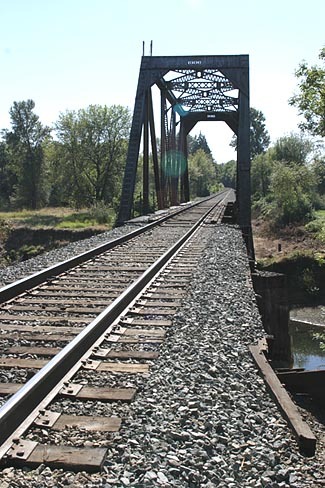 The thru truss bridge is a fairly standard SP design, this one 5 sections in length. Other similar examples of this bridge design can be found further down the valley and all over the western portion of the old SP. The bridge is perched on concrete footings about 20 feet high. Ballasted deck wood pile trestles connect each end of the truss bridge to terra firma, another classic configuration found on many river crossings all over the western part of the Espee system. The truss bridge is the focal point of the module. 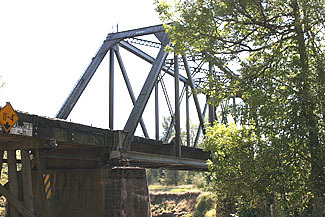 The prototype bridge dates from 1906, installed when the line was modernized at the beginning of the century and many of the bridges in the Willamette Valley were rebuilt. Despite the age of the current bridge installation, you can still see old pilings from the original wood trestle under the south end of the structure, right next to the cement pier. Anderson Road passes under the wood pile trestle on the north end of the bridge. The low clearance shows evidence of many close encounters with vehicles over the years. 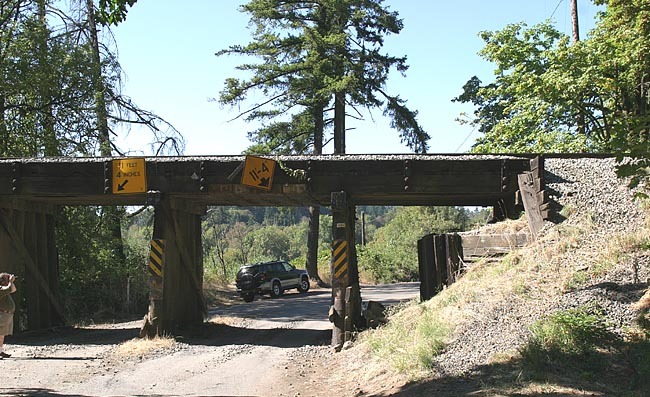 Several generations of warning signs adorn the bridge, and the entire scene is shaded by numerous large deciduous trees (Cottonwoods and Alders) as well as several examples of the northwest's ubiquitous Douglas Fir. I'm modeling this scene on a 2 x 6 foot module, one designed to (hopefully) stand up to the added stress of transport to and from events. The module structure features a cutout section to provide sufficient height of the bridge over the river's surface. Construction uses 3/4" birch ply on the ends, and 1x3 fir strips lengthwise. A 1/4" hardboard fascia frames the assembly. I'm using pink foam to form the base of the module. Wood screws and construction adhesive hold everything together. The leg assemblies are designed for easy setup and teardown. Legs are 2x2 fir, which fit into pockets in the bottom of the frame. A horizontal 1x3 fir strip carries the load. No mechanical fasteners are used to hold the legs in place - gravity does the job here. 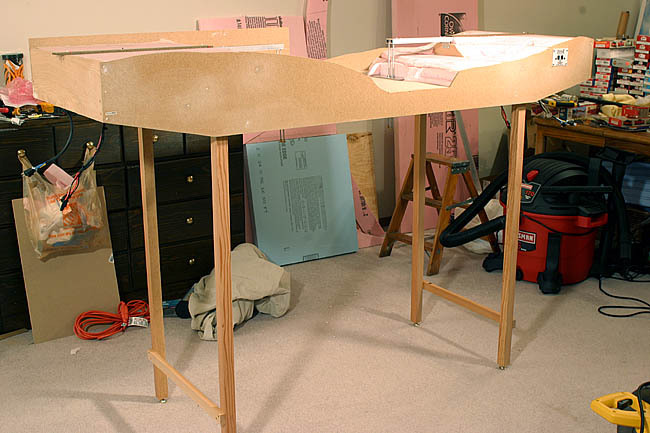 The river cutout uses a hardboard surface laminated to the foam with construction adhesive in order to add torsional rigidity to the benchwork assembly. It also provides a nice smooth surface for the river, which I plan to model using gloss medium. I would prefer to use Enviro-tex resin, but I'm worried that it will crack and lift from the module surface during transport. The module is already wired with the track and power buses, as well as the LocoNet bus. Two Digitrax UP-5 panels are mounted in the fascia, one on each side of the module. The profile board is half-cut in this view; the far end still needs to be contoured and the foam shaped. One challenge of modeling this scene was to devise a way to build a rigid subroadbed assembly for the track at the wood pile trestle sections. Because this is a module that is designed to be portable, I wanted something that would be robust and sturdy enough to stand up to years of use - I couldn't count on scale wood to support the track!! To solve the problem, I built subroadbed out of aluminum channel and flat bar, as shown below. Threaded rods support the inner ends of this assembly - they allow for adjustment of the assembly over time should the module sag or bend. The rods will be concealed inside the hollow bridge pillars, which I plan to model out of styrene. The Central Valley bridge box girders will mount to the ends of the aluminum subroadbed sections. In order to represent the wood ballast deck of the prototype, I plan to laminate wood strip to the outside of the aluminum pieces to represent the bridge timbers. I still need to cut off the extra length of the screws protruding thru the bridge deck, and then trim sections of cork roadbed to fit on top of he aluminum subroadbed. I plan to use Code 83 Micro-Engineering flex track on this module. I'm currently kitbashing the actual truss bridge model from a Central Valley kit and Evergreen Styrene H-beam sections. The modifications to the kit are straightforward - primarily, I had to shorten the CV bridge kit by one section, and then replace some box girder sections with H-beam, per the prototype. The end detail is different as well. Next up - finish roughing in the foam and fascia board, and scratchbuild the pile trestles at each end. No structures are planned beyond the bridge components, but I do plan to model the roadway and underpass as shown in the prototype photo above, in addition to the large trees that shade the area.